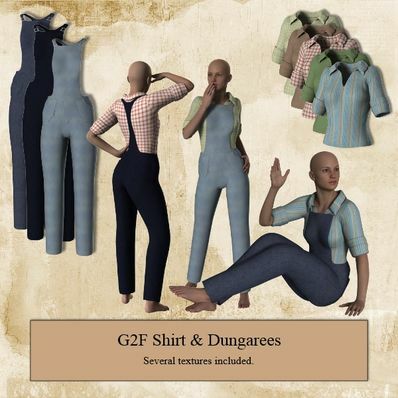 Shirt & Dungarees for Genesis 2 Female for use in Daz Studio 4.6. Thx a lot, very nice clothings! I like alll your clothing. They are the only free ones that fit perfectly on the characters and the textures are also OK. I miss some typical Levis type, low cut jeans for Genesis 3 Female. Are you planning to do one? Thank you. I love the fact that you think of clothes that no one else has. Very nice, thank you! I really like the slim style in the back. Just right for some serious farmwork! Thanks for this one, Wendy! Love your clothes, they are so natural. The shirt and dungarees are so perfect for those hot summer evenings on the farm or a friendly hoe-down. Thank you for all the various textures, such attention to detail. It's wonderful! Very nice set; thank you! Awww! Very nice! Thank you so much! Thanks so much for your generosity of sharing these outfits.